Lots of ingredients in this recipe, but it’s super simple and scrumptious! In a Dutch oven, cook sausage, ground beef, onion, and garlic over medium heat until well browned. Stir in crushed tomatoes, tomato paste, tomato sauce, and water. Season with sugar, basil, fennel seeds, Italian seasoning, 1 tbsp. salt, pepper, and 2 tbsp. parsley. Cook lasagna noodles in boiling water for 8 to 10 minutes. Drain noodles, and rinse with cold water. Spread 1 cup of meat sauce in the bottom of a 9×13 inch baking dish. Spread one half of the ricotta cheese mixture. 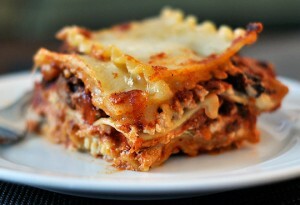 Spoon 1 cup meat sauce over mozzarella, and sprinkle with 1/4 cup Parmesan cheese. Repeat layers, and top with remaining mozzarella and Parmesan cheese.